Sony MDR7506 Professional Stereo Headphones are ideal for sound monitoring in recording studios, radio, film production, video, electronic news gathering - and virtually any application where high quality sound is required. The closed-ear design MDR-7506 is outrageously popular in pro and home recording studios. It features a rugged design, convenient folding construction, 40mm driver units, gold connectors and a professional-quality OFC (oxygen free copper) cord. Sony 7500 Series headphones offer a practical range of choices for everyone from the casual user to the studio pro. These include the MDR-7506 which is lauded by many professional studios and broadcasters. Features Rugged Design: Proven to be reliable in the toughest situations Folding Construction: Compactness in storage 40mm Driver Unit: For clear, high quality sound reproduction Closed-Ear Design: Comfort and reduction of external noise interference Stereo Unimatch Plug: 1/4 inch and 1/8 inch applications Gold Connectors and OFC Cord: Reliable and stable signal connection and transmission Supplied Soft Case: Protective storage AmericanMusical is an authorized dealer of Sony products. 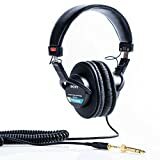 The Sony MDR-7506 Professional Large Diaphragm Headphone is a large diaphragm foldable headphone designed for professional studio and live/broadcast applications. These large diaphragm, foldable headphones feature a rugged construction, a secure, highly effective closed-ear design, and a 40 millimeter driver unit for clean, clear sound reproduction. 9.8 foot cord ends in a gold 3.5mm plug; 1/4-inch adapter included. Headband with generous padding for added comfort. A neodymium magnet provides excellent power-handling, and 40-millimeter drivers deliver high-quality sound, with a wide frequency response of 10 Hz - 20 kHz. Enjoy crystal-clear highs, present mids, and an extended low-end, for accurate monitoring. The MDR-7506s feature a closed-ear design, which provides both comfort and outstanding reduction of external noises. Comfort is only enhanced by the generous headband padding. A 9.8-foot coiled cord provides more than enough slack for working in a studio without removing the phones, whether you're the performer, the engineer, or both. The included Stereo UniMatch plug allows use in both 1/4-inch and 1/8-inch applications, and a soft case for protective storage is included with the headphones--fold them up and stow them a way safely.